I love the balance of flavors and textures in these tacos. Perfectly soft shredded beef, delightfully fresh crunch from the cabbage, plus wonderful flavor combinations from the lime, cilantro and salsa verde. Also, flour or corn…it’s entirely up to you. I’m on a bit of a corn tortilla/street tacos kick these days, hence the use of corn tortillas for us. Reason: they are c.h.e.a.p. You can get a bag of 50 corn tortillas here in San Antonio for less than $2. Yes, please. Plus, they store well in the freezer…so I don’t have to worry about them going to waste. Win-win! 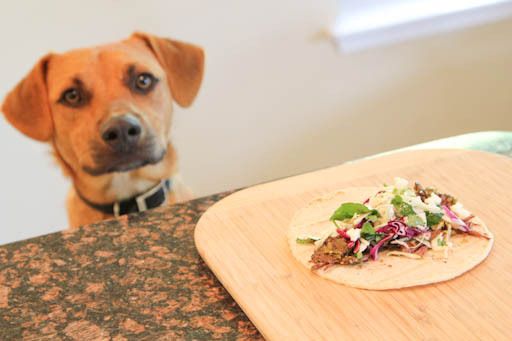 Hope you enjoy these tacos as much as we did! Place the beef in the base of the slow cooker and season with the ground cumin, salt and pepper. Pour the salsa verde over the beef. Before serving, prepare the slaw in a mixing bowl by tossing together the slaw mix, chopped cilantro and vinaigrette. Assemble tacos by placing some shredded beef in the middle of the tortilla, and top with the slaw and some cheese. 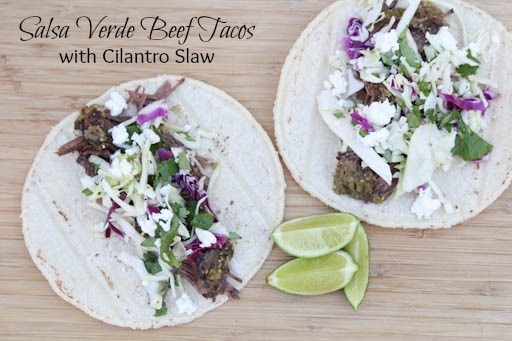 Serve Salsa Verde Beef Street Tacos with Cilantro Slaw and side of fresh fruit or veggies. Freezer Instructions: freeze the cooked, shredded beef in a freezer bag with the salsa verde. Remove excess air. Freeze until ready to use. When ready to serve, thaw and reheat. Prepare the cilantro slaw and veggies to serve.